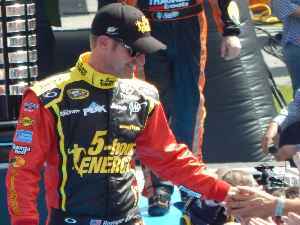 Clinton Edward "Clint" Bowyer is an American professional stock car racing driver. He currently competes full-time in the Monster Energy NASCAR Cup Series, driving the No. 14 Ford Mustang for Stewart-Haas Racing. Prior to driving for Stewart-Haas Racing, he drove for HScott Motorsports for one year, Michael Waltrip Racing for four years, and Richard Childress Racing for eight years. Bowyer won the 2008 Nationwide Series championship driving for RCR.